GMail is one if not my favorite email provider. Like any other service that is free, you'll have to deal with annoying ads and sponsor messages. If you can't stand these annoyances then you can surely remove them if your using Google Chrome with the help of extension. 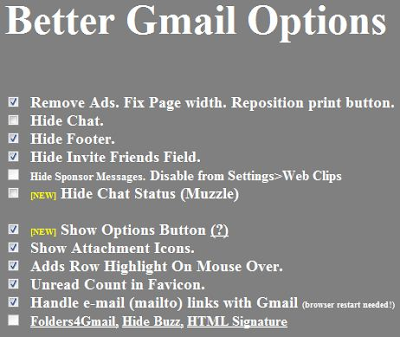 Better GMail extension is what they call it can remove ads, chat, invites, footer, and a lot more. Just install this Google Chrome Extension and you will be able to use your GMail (w/ Google Chrome) without the annoyances. To configure the extension, click on the Chrome Wrench > Extensions > Better Gmail Options.